It’s back and more popular than ever! 32 dogs are lined up to compete for the CBWB Top Dog. Pup parents from our facility have submitted their entries. The voting has begun! Round one has started! And the Champion will win a FREE Spa Weekend at Camp! The 2nd place winner will receive a free day of daycare and a free bath. All final four dogs will get free nail trims! Check out our Grooming Services. 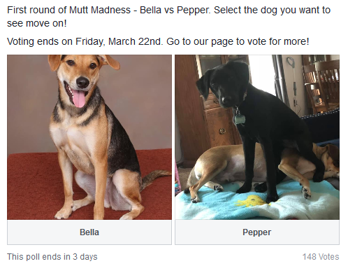 With YOUR votes, we will narrow it down from 32 dogs to 8 dogs between rounds 1 and 2. Keep voting daily and watch who makes it through to the next rounds! Who will win this year’s Top Dog?